A new version of the popular AOMEI Backupper backup software for Windows was released yesterday introducing new features such as support for backup schemes and improved command line support. The program, available as a limited free and Pro version, is listed on our best free drive backup programs listing for Windows, and updated frequently with new features, for instance File Sync in Backupper 2.8. AOMEI Backupper 3.0 introduces two new features of which one is only available in the Pro version of the application. Backup schemes allow you to manage backups automatically in order to save disk space on the backup drive. 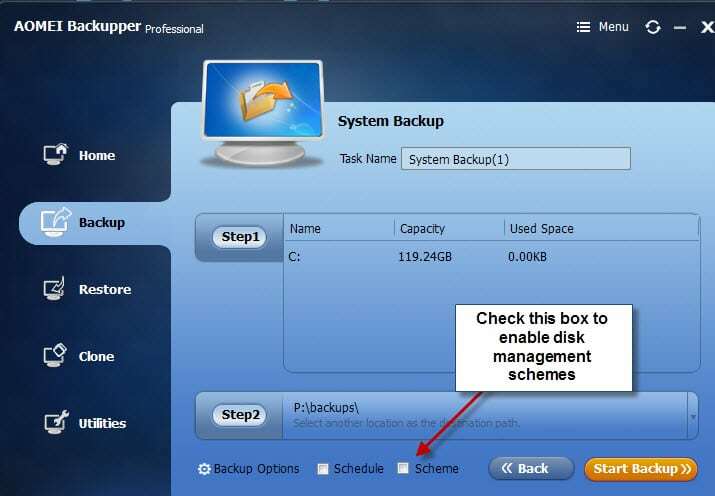 It enables you to select a scheme for a backup that is executed by Backupper when certain requirements are met. To use the new feature edit an existing backup or create a new one, and check the Scheme box on the configuration page. The available options are listed on the next page. While it looks on first glance as if it allows you to set a maximum number of backup copies to retain at any time, it offers more than that. 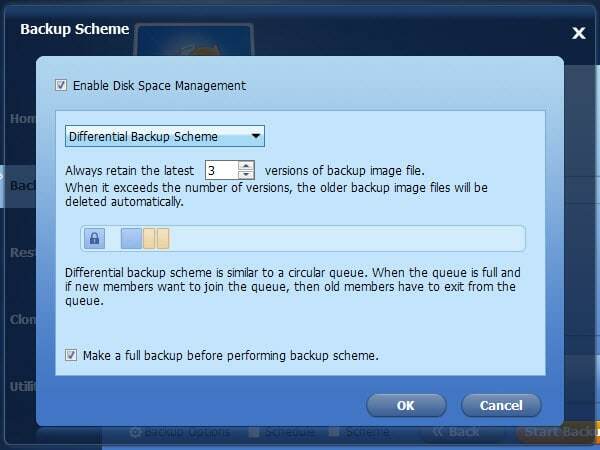 If you select the space management scheme for instance, you are asked to specify when you want a full backup to be created after creating a certain number of differential backups. It will furthermore automatically check disk space availability and delete older backups if disk space is running low. To give another example. If you select incremental backup scheme, backups are assigned to groups and you decide when to delete a group and create a new one in the process. Two new command line options were added to Backupper in version 3.0 as well. AMBackup /c runs the new clone command and AMBackup /r the new restore command added to the new version of the application. The new version supports a couple of other features that may be interesting to some users. It supports 4K monitors for instance, and the PXE boot tool supports the deployment of WIM image files now. Users may also select to perform power-state changes after successful backups to restart, sleep or hibernate the machine. The new features that are introduced in AOMEI Backupper 3.0 improve the program further. The main new feature, backup schemes, is not available to free users on the other hand but Pro users may find it useful especially if they run into low backup disk issues frequently. Both versions are available for download on the developer site. Now You: What is your backup program of choice? For simple home use using Veeam Endpoint Backup provides for free, filtering of Restore Points, as well as files & folders. Additionally for quick frequent backups – FreeFileSync. Genie Backup Home – not free, using that on a network. Backupper 2.8 – free version, on wife’s laptop. Zool.com, cubby.com, OneDrive, mega.co.nz – using all of them on my computer. Genie Backup is wonderful… but doesn’t it “fit” in a separate software category from AOMEI backupper? Maybe I haven’t fully explored its features, but I have the impression it primarily serves as a “sync” agent. Macrium Reflect has always treated me right. Imaging and folder backups, email alert support and Linux recovery ISO with the option of making a WinPE based recovery disk. All round nice solution and well priced if you want more features than the free version offers. Martin, this might sound like a pointed question, but I’m sincerely asking. Can you cite, or at least describe, your basis for the observation that AOMEI Backupper is “popular”? and am confounded by the lack of attention AOMEI Backupper receives, across the various forums I visit ~~ especially the wilderssecurity forums. Specific to wilders, I’ve inferred (guessed) that everything is swayed by the interest(s) of a scant few “influencers”, participants who are hailed as experts, and rise to the occasion of filling such a role. Although I don’t have reason to believe that any of these influencers are plants (paid advocates), I’m stymied in understanding why such a seemingly (to me) good product such as AOMEI Backupper hasn’t gained more traction/attention. THAT is why I’m asking; maybe I’ve just been haunting the wrong forums? Setup new win7pro PC, add virtualPC/WinXP Mode (and fully update, and customize), add various desktop programs, then backup to HDD, then restore to a new SSD. Cumulatively, the “freshly installed/configured” system occupied about 28Gb on disk. Full system backup via AOMEI Backupper, from SATA3 C: drive to a SATA2 drive, took about 7 minutes to complete. Resoration, from the SATA2 drive to a blank Samsung EVO 850 SSD (256Gb, FWIW), took about 4 and a half minutes. After the first run, I was stunned. Done already, so fast? Dang, did it really, actually, work? I’ve not yet tried restoring to entirely different hardware (different mobo, CPU, different GPU) and that’s what I’m interested in finding user-posted discussions aobut. I did (redundantly, ’cause I __never__ want to wade through this setup chore again) “restore” multiple times along the way during system setup, restoring onto various blank HDDs. FWIW, restoration from the backup image residing on the SATA2 drive, to a SATA3 target took about 8.5 minutes (ave., across multiple runs) and about 11 or 12 minutes to SATA2 target drives. Well I cannot say how popular it is in comparison to other backup programs, but in my circles, it is fairly popular. I do not recommend this software under any circumstances. My 5 year+ factory XP setup was ready for a long overdue backup. I used this AOMEI software due to my earlier success with their partitioning software. I opted for ‘encrypted’ backup, set the software up and away I went. It took the contents of my C Drive SSD and instead of copy and archive it performed a move and archive backup for me. I lost the contents of the drive after windows finally froze up because all the unlocked files were missing, and to compound the error, the encrypted backup will not open as the AOMEI software does not recognise its own container format. Although I had most of my setup backed up, a new install gave me a new windows account identifier which then made some software installations inoperative and of course any windows encrypted NTFS drives were useless because the user who created them did not exist. Perhaps it’s all my fault, but if you like your windows setup, I wouldn’t recommend you touch this product with a barge pole. Darn. Still won’t start on Windows Starter edition. They don’t know why or much seem to care. Does “Windows Starter edition” lack VSS? If so, it’s understandable that Backupper can’t start ~~ it depends on availability of the Volume Shadow Service (for access to any ‘locked/inUse’ files). Thanks, ams. I checked everything as per here: https://support.software.dell.com/replay/kb/117665 and all seems well with VSS according to its check procedure. Sure worth a look though. Tried this and it does not see mapped drives to backup to. I have a mapped drive from one system on all my other computers and this program when selecting destination does not even see the mapped drive and not even the network so this one does not work for my needs. Perhaps you should contact them about this. Backing up to mapped network drives works fine here with free version so it is not a basic restriction. Been using this application on the Test subject machine to restore it after resetting the Windows 7 activation three times and have to agree with Martin it is a fairly decent application to have. A couple of more details please. How did you perform the system backup among the several ways Backupper can do it and similarly how did you restore so as to be bootable? Thanks. I am missing the command line utility for making a file type backup.